It’s Easter time and everyone is getting their eggs ready to be dyed, hidden, found and gobbled up. 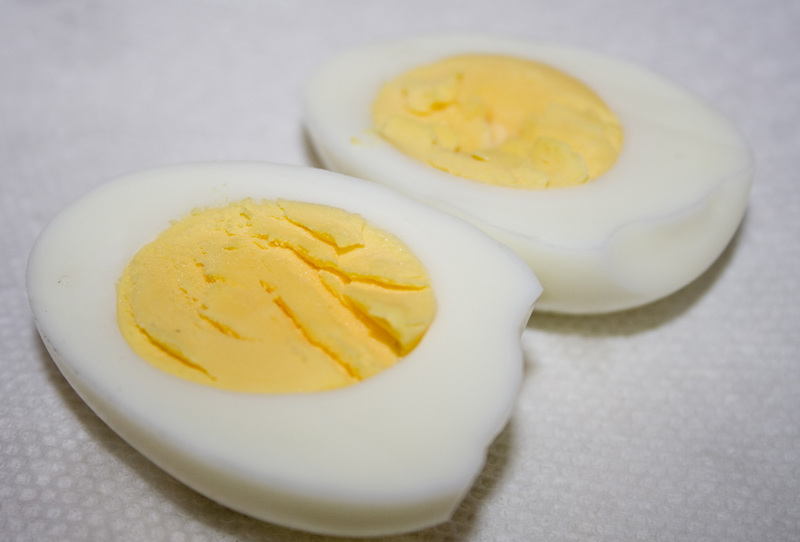 I’ve discovered a couple of things that help create absolutely perfectly hard-boiled eggs. You may be thinking “How hard can it be? Throw some eggs in some bubbling water, right?” Wrong! It’s really a science. There are atrocities passed off as hard-boiled eggs on every buffet table in America. No more I say! No chalky yolks. No ugly gray rim where the yellow meets the white. No dry rubbery texture. And most importantly of all, no pockmarks where you’ve spent 30 minutes picking off miniscule pieces of shell that stubbornly cling to the egg despite your best efforts. I believe in a better egg! Ok, climbing off my soapbox now to tell you exactly how to do it! 1: Age Before Beauty: Use old eggs! At least 5 days since you bought them. I know, it is Easter and too close for this hint to be truly helpful since you’re probably all scurrying out to buy eggs right now. If you have a few in your fridge already, use those ones! This is the number one way to make your eggs perfectly peelable. For the full details on WHY this matters, check out this awesome book. I love knowing the science behind cooking mysteries. If you have to use new eggs, boil them as detailed below and then wait a couple of days (with them in the fridge) before actually peeling them. 2. Don’t Drain the Lake: You don’t need a huge pot with 12 gallons of water in it to make hard-boiled eggs. Just the opposite in fact. Only cover your eggs with an inch or two of water. The more liquid in the pan, the more room for the eggs to get jiggy when they’re hanging out in there. Rocking and rolling eggs make for cracked eggs. Do a single layer of eggs and then JUST covered with water. 3. No Party Zone: Don’t let your eggs sit there partying in boiling water. Take them off the heat as soon as they start to boil. This method is a much slower cook than boiling water would be, which makes it much harder to overcook them. Even if you forget about them and they cook for a few extra minutes, chances are they still won’t get gray and dried out. If you are like me and cannot just stand around the kitchen waiting for a timer to go off, this is much more forgiving when you forget about your eggs because you were trying to get a load of laundry folded. Those are my top three tips. Here’s the full instructions on creating perfect eggs. Enjoy! 1. 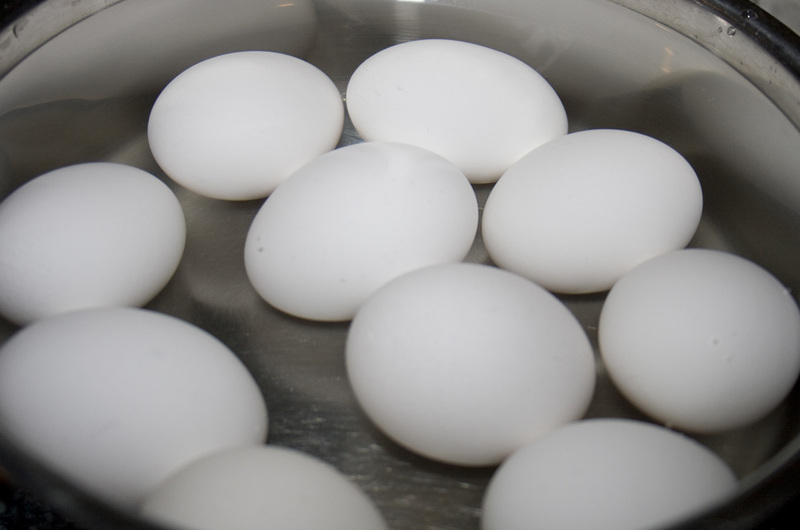 Put the eggs in a single layer in a saucepan, covered by an inch or two of cold water. Starting with cold water and gently bringing the eggs to a boil will help keep them from cracking. Add a little salt (about a teaspoon) to the water and swish it lightly around. Put the burner on high and bring the eggs to a boil. As soon as the water starts to boil, remove the pan from the heat and cover with a tight-fitting lid. 2. Let your pan sit, covered for 10-12 minutes. The eggs should be done perfectly at 10 minutes, but sometimes, depending on the shape of the pan, the size of the eggs, the number of eggs compared to the amount of water, and how cooked you like them, it can take a couple more minutes. You’ll figure out what time works best for your pan, how many eggs you typically do etc. When you find the magic number, just keep leaving them exactly that amount of time. 3. Remove the eggs with a slotted spoon and place them into a bowl of ice water. This stops the eggs from continuing to cook in their own heat. They are pretty much mini ovens inside at this point. Ice ice baby. Get em’ cooled down! Once cooled, remove from the water and put in the fridge. Eat within 5 days. Sigh, I am guilty of so many of these offenses. The throw ’em the water and forget about them being my first and foremost. Although, recently I accidentally made a soft-boiled egg inadvertently. That was a delicious mistake. Great post and pictures.